Situated on the banks of Nandini river, Aihole Durga temple is the spiritual energy center of South Kanara district of Karnataka. It has become a famous pilgrimage and a tourist center over the years. Aihole temple is a landmark of the religious life which is maintained by the Archaeological Survey of India. 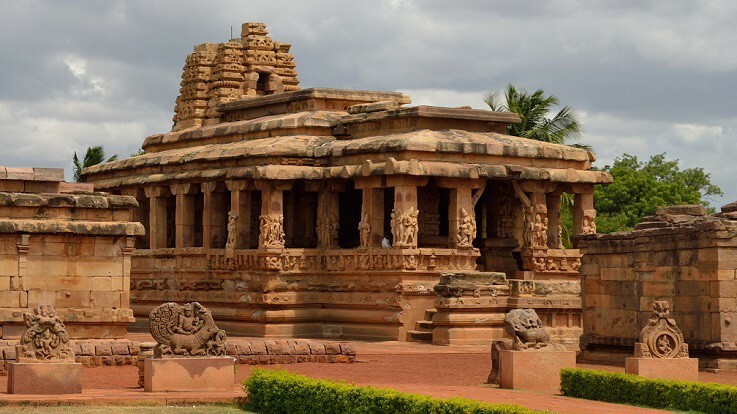 Aihole Durga Temple exhibits a blend of Dravidian and Nagara architectural style. Due to its beautiful temples, Aihole is known as the ‘cradle of Hindu rock architecture.’ It is also an important place as it is believed that Lord Parusharama after fulfilling his vow of avenging his father’s murder came down to the Malaprabha River and washed his blood-stained hands and the Axe. The river turned red due to the blood on the Axe. A local lady saw the red water and shouted Ayyo, Hole! (Oh No, Blood!) and hence the place got the name Aihole. Another version said that The name “Aihole” came from the words Ayya hole, or city of scholars (in Sanskrit, Arya Pura). As per the legend, once, a severe drought hit this place. The great Sage Jabaali used his 'Jnana Drishti' and found out that demon Arunasura had made the people stop all yajnas as revenge against the 'devas.' Demon Arunasura acquired a boon from Lord Brahma that he would not suffer death from any two-legged or four-legged being or any weapon. After gaining these powers, Arunasura conquered heaven. The Devas prayed Goddess Durga for help.Goddess appeared as a beautiful woman. Arunasura approached her. She reminded him that she had killed Shambasura and from whom Arunasura had escaped death. Arunasura got angry and tried to kill the Goddess with a sword. The Goddess turned into the stone. When Arunasura slashed the stone with the sword, a vast swarm of bees emerged from the stone and stung him. Aihole Durga temple was built by Chalukya dynasty between the 7th and 8th century. The temple is often mistaken to be a Durga Temple. The presiding deities of the temple are Lord Vishnu and Lord Shiva. The word ‘Durga’ here actually means fortress. The most attractive feature of the temple is a peristyle delimiting an ambulatory around the temple with the walls covered with sculptures of various gods or goddesses. Two staircases provide access to the porch at the temple entrance. The parapet is carved with niches and animals. The porch gives access to 'Mukha-mandapa' and "sabha-mandapa" leading into the Garba-Griha. The Durga Temple Aihole is quadrilateral, and the contour of the temple exhibits the Gajaprasta style. Also known as the fortress temple, Durga Temple Aihole depicts a Buddhist chaitya which is adorned with carvings. The seven-headed serpent carved at the ceiling of the Durga Temple of Aihole is an impressive work by the artisans. The temple walls are decorated with sculptures of Hindu gods and goddesses. There are several rooms along with a Garba Griha where the spirit of the shrine is located. The elevated plinth, the big galleries, and the molded adhisthana are the characteristics of the Durga Temple. The sculptures of Lord Narashima, Goddess Chamundi, and Lord Shiva are the other attractions of the Durga Temple. 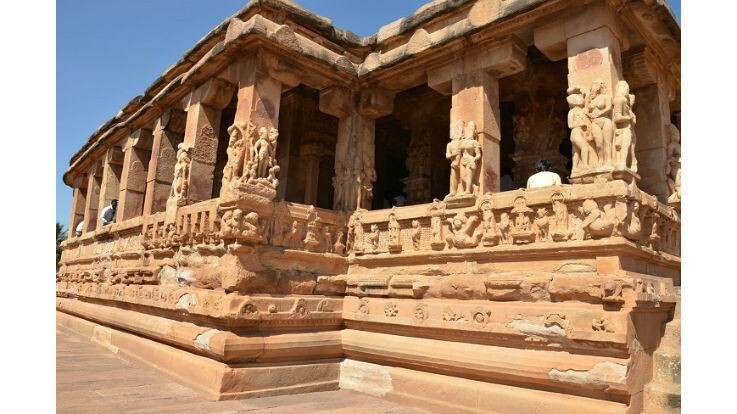 Durga Temple the tourist spots of Aihole due to its rich history and architectural features. The winter season (October – January) is the best time to visit the temple. By Air: The nearest airport is Belgaum airport (189 km).  By Road: Aihole easily accessible from the major cities of Karnataka. 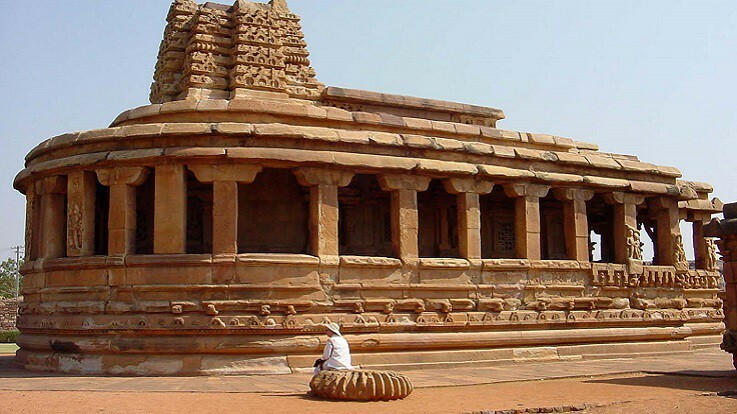 The place is located at 17 km from Pattadakal, 44 km from Badami and 490 km from Bangalore. Tourists can hire private vehicles. By Train: The nearest railway station is the Hubli (34 km).